Beautiful Red & Golden Beads Bandhanwar, Door Hanging Toran 40"
Beautiful Red & Golden Beads Bandhanwar, Door Decor Hanging Toran. 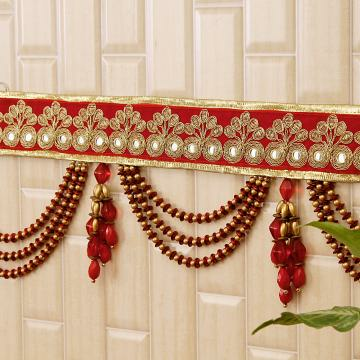 Decorate your home in traditional style during festival or wedding. Use it as Diwali Banner, Wedding Decoration and for pooja / home decor. This item in Handicraft & Home Decor category was first added to our catalog on 10-05-2017. Buy Beautiful Red & Golden Beads Bandhanwar, Door Hanging Toran 40", sold & shipped by IGP where you can shop online for Exclusive Collecton of Indian Handicrafts, Festival Items & Ethnic Gifts. This Door Toran collection has been tagged as USDWUA0004, Thoran, Wedding Accessory, Diwali Banner Home Decoration, Toran, Door Decor, Indian Handicraft, Door Hanging Artwork.